Our 3rd grade students are building their moral and analytical skills to define good citizenship! The students crafted a project to identify and explain the qualities and responsibilities of a good citizen. They even researched people both local or historical who display the qualities of good citizenship. Why teach 3rd grade students about good citizenship? This project is a great opportunity for students to learn what it means to be civic minded, as they develop critical and analytical thinking skills through student centered project-based learning curriculum. How excited were students to participate in the project? Students were very enthusiastic about selecting their choice of project and presenting it to their classmates. The students identified the qualities that make a good citizen and discussed example of people that exemplified these characteristics. Then the students picked their own local or historical role model to research for their report. The students had four choices in the design of their presentation. They could: make a brochure, build a quiz board, write and perform a play, create trading cards, make a power point, create a puppet show, or write a story. The project took place as a supplemental enhancement to the good citizenship lesson. As an assessment, it reinforces the students’ comprehension of the qualities that define good citizenship. Lessons and projects such as these are designed to foster moral discernment, and recognition of what is right and just. The students’ use of their critical and analytical skills to determine good citizenship serve to strengthen their social, political, and economic decision making. These are tools that they will need to carry them forward in all areas of essential life skills. The 3rd grade students really respond to the freedom of choice in design and development of their research project. 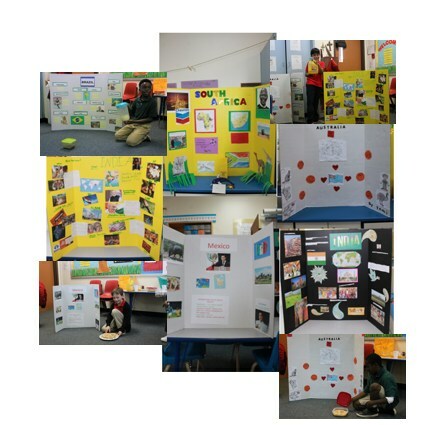 Some of the students independently chose to combine one or more project design choices to enhance their presentation. Discuss the qualities that define a good citizen. Incorporate current news events for students to compare good citizenship qualities to the people interviewed or discussed in the news stories. Our 4th grade students are learning some really cool things in science this spring! This month, they learned that sound occurs because of vibrations and that sound also changes depending upon the type of media that it travels through (i.e., water, air, and solids). Why teach “Sound Energy and How Sound is Made” to 4th grade students? At this grade level, students’ intellectual skills and curiosity are still stimulated by the unique concepts surrounding the creation of sound. They are excited to participate in labs with a heavy tactile component, which allows them the freedom to explore and experience the information firsthand. How excited were students at the start of the project to learn and explore the topic? The students were very eager to learn in this type of “hands-on” experiment. They were through the roof with excitement, ready to help setup their labs in any way. How confident were students to display a working knowledge of their acquired skillset? The students were very proud about the new things they learned and how well their efforts paid off to generate sound. They even became a bit competitive in seeing who could make the most impressive sounds through the science instruments. Labs are an interactive way for students to experience science for themselves. To perform the labs, the students used different tools to observe how sound behaves. 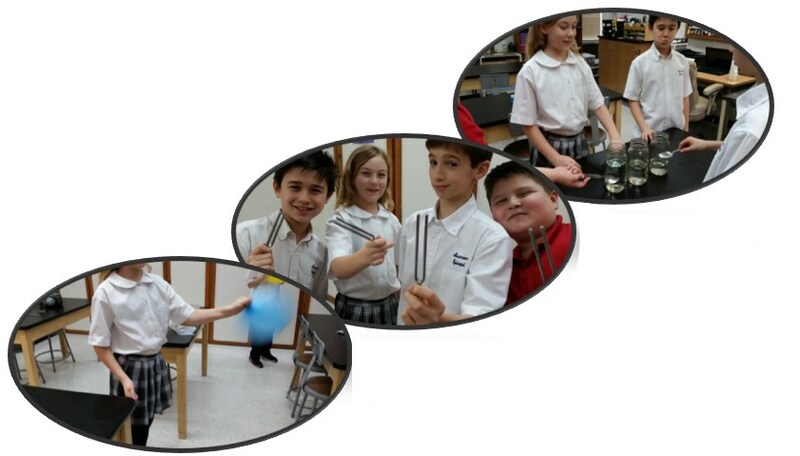 The students experimented with how a tuning fork can visibly demonstrate the way a sound travels through water. In the water lab, glass jars filled with different levels of water were struck by a metal spoon to crease musical notes. In the hex nut lab, the students placed a hex nut inside an inflated balloon, then swirled the balloon around to generate a “whining” sound. This lab provided a tactile demonstration of physical force required to produce sound. There are two very important concepts that students learn in science that are applicable to most situations in life. The first concept is to be open to learning a lot of information and new ideas. Secondly, they learned not only from the labs that were successful, but they also learn more from the labs that were not. Science is not exact. Often times, you have to fail your way to success. It is this type of positive attitude that will help them throughout their academic career and in their personal endeavors. “If at first you don’t succeed…Never Give Up!”. The students discovered that, like light, sound is a form of energy. The students learned that the humming sound produced by striking the tuning fork is caused by the air molecules gathering together and moving in a pattern to create a sound wave. The students realized that the different water levels in each jar created a different pitch in sound. The students determined that hearing, is a series of sound waves reaching their eardrums that their brains sort into categories of speech, music, laughter, etc. This February, our 1st grade students were building with LEGOs and writing stories! The stories were centered around the LEGO creations and presented to the class; parents were invited to come and hear the stories as well. Why teach creative writing to students in 1st grade? The process of creative writing is a beneficial tool in students’ writing development. It allows for the students to write a narrative that is unique to their imagination, while developing their vocabulary and sentence structure in tangibles ways to build dynamic stories. The students were very enthusiastic to start this project, as it had a surprise element, LEGO building! The inspiration provided by building with the LEGOs is to strengthen their confidence in their ability to write in a free-form manner. Students may feel reluctant to write, when faced with a blank sheet of paper to compose a story for an open-ended topic. By incorporating the LEGO building component, the students were able to explore their imagination to generate content for their stories. How confident were students to present their findings/display a working knowledge of their acquired skillset? The students could not wait to share their stories with classmates and parents! They were confident and proud to share what they had created. The students eagerly listened to each other’s stories and enjoyed seeing the LEGO creations. The students were partnered in groups for collaboration, to provide feedback and editing, and correct spelling mistakes. The students had full creative license to build anything with their LEGOs, as they explored the boundaries of their imagination. They were encouraged to use different ways of writing: reality, fantasy, past experiences, storytelling from their peers, a movie, or books. This provided the students with a resource base for their story content. They were instructed to use characters, a plot, a setting, a theme, problems, and solutions in their story. They were also asked to use their senses: sight, touch, taste, smell, and hearing, when describing the environments in their story. The students are learning to utilize their imagination in a constructive way that is helping to develop the writing skills that they will need for second grade. This project also provided the students with an opportunity to practice their public speaking skills, as they stood at the front of the class in presenting their work to their classmates and parents. The students, parents, and I all enjoyed the stories and the LEGO creations. The things that stood out the most is the freedom the students felt in being their own “creative director”, that the sky was the limit. The end result was that the build and story was solely theirs. Our 2nd Grade AES Eagles took part in an interactive research project this winter. They were tasked with selecting a country and investigating the history and culture of the people. With a focus on active participation and learning, the students did their own research with minimal parent participation. The students wrapped up the project by making a simple dish from their chosen country as part of an International Food Festival held right in the classroom! How did the Country Project come about? The goal was to incorporate an international component into the students’ social studies curriculum to expand their independent research skills. And in addition, this project gave the students the freedom to choose their subject content. Students were required to do their own research with little help from their parents. The main goal was for intrinsic learning to take place through the interest and passion of the student. They were allowed to discover many unique attributes in the history and culture of a country of their choosing. How excited were students at the start of the project and then later when presenting their findings? The students were so excited to learn that they would have the ability to choose their own country of interest. 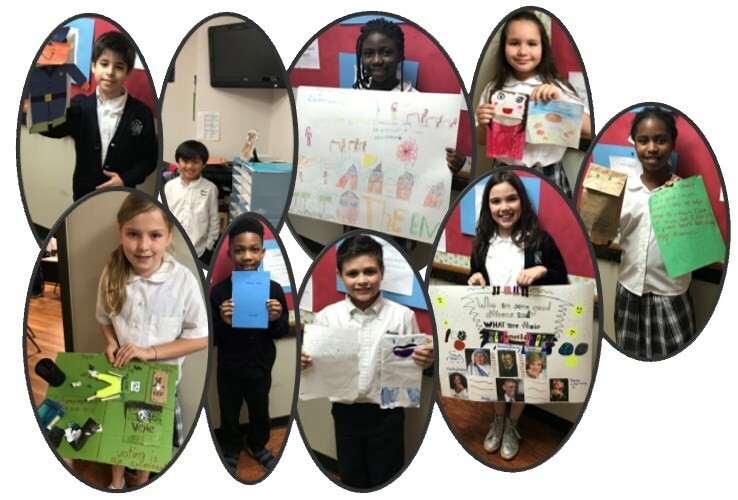 And on the day of presentations, the students were proud to display their vision boards filled with unique and dynamic facts about the people and places of their country. The students confidently stood in front of their peers ready to share all that they had discovered. They could not wait to show what they learned and to share samples of food and drink commonly known to the country’s population. How do the principles of this learning process carry over in the students’ day to day learning experience? The students were encouraged to think for themselves in all subject areas. Through projects like My Cool Country Project, students sharpen their critical thinking skills, expound upon their creativity, and become more attuned to utilizing the standard principles of research: who, what, when, where, how, and why. My Cool Country Project provided a tangible channel for students to develop their research skills, lift the cap off their creativity, and stimulate independence in learning. In the process everyone learned many new things about people and places around the world, had fun, and strengthened their tenacity for learning. Additionally, this project established critical lifelong learning skills required to carry the students forward as they prepare for the 3rd grade.